Most developers know of the PHP and LAMP/WAMP stack. 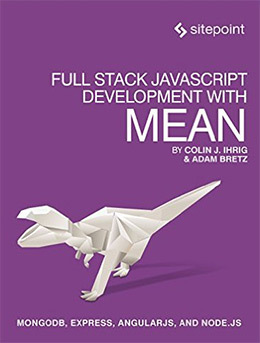 MEAN is gaining traction for its breakneck speed and its use of JS on the frontend+backend. But since it’s such a new technology it can be tough to learn. That’s why I’ve curated the top 10 books covering the MEAN stack from start to finish. Each book varies in complexity and subject matter but all of these resources can dramatically improve your skills as a MEAN web developer. If you’re completely new to the MEAN environment then the best book you can get is MEAN Web Development by Amos Haviv. Currently in its 2nd edition it’s one of the more detailed guides you can find covering every layer of a MEAN application. But even with so much detail it’s still the best intro guide based on practical exercises, a conversational writing style, and up-to-date code snippets. Then you slowly move through Angular and Express to understand how these technologies stack to build MEAN applications. Early chapters hold your hand to help you setup a local testing ground for your MEAN server. You’ll also learn about the fundamentals of Angular like data binding, making controllers, and basic routing. In later chapters you’ll learn about Gulp.js for task automation and how to use a JS linting tool to check all your code. This is one of the more detailed books on MEAN with a clear organizational structure and 370 pages chock-full of resources on the stack. Note this development cycle doesn’t rely on traditional MVC development techniques. The Angular frontend connects with the Express/Node backend using a variety of techniques, and the author clearly explains all of them in great detail. This is the best book for a semi-experienced developer who wants to move over to the MEAN stack. It also works great for beginners but it may take a little longer to work through the exercises. 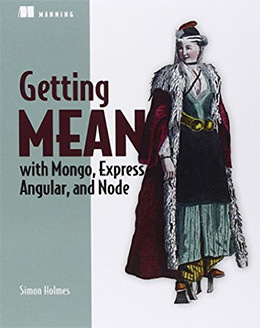 One of the better books in this collection is Getting MEAN with Mongo, Express, Angular, and Node. It’s 440 pages long written by fullstack developer Simon Holmes. In this title you’ll learn all about the Node.js setup from creating a local instance and configuring the server to building your first application. Best of all you don’t need to know any Node.js prior to this title. However I will say that later chapters can feel a bit outdated since the JS world moves so fast. The raw information is still factual and even surprisingly helpful. Simon’s writing style is terse but accurate. He doesn’t sugarcoat any of the MEAN dev stack so you should already have some level of programming knowledge before grabbing this title. But for the money I think this book is perfectly suited to teach practical development with MEAN. You’ll learn all the basic technologies and many others that you can add like Bootstrap and Git. What I like most about this title is the way it breaks down the MEAN stack. It’s very different from a LAMP stack so PHP/MySQL devs will enjoy this book. Early chapters cover a lot of theory but follow up with relevant exercises. You’ll learn how to properly organize, architect, code, test, and deploy a full MEAN application from scratch. 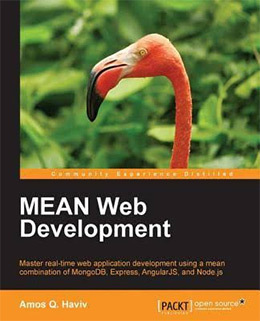 For only 312 pages this is one of the most comprehensive development books on MEAN. But you can pick up this book with no prior MEAN experience and by the end you’ll be surprised how much you’ve learned. Since Node is the foundation of a MEAN stack it makes sense to study the Node.js framework in great detail. 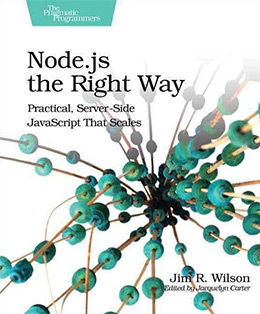 And Node.js the Right Way is the best book for this task. It’s a pretty small read with only 150 pages but it gets into many related plugins & 3rd party resources. The author Jim Wilson does a great job covering Node, npm, and Express.js. But he also gets into Redis, CouchDB, and RESTful development. The sole purpose of this book is to understand how a Node.js server operates. You will learn how to build Node webapps but you’ll also learn how to optimize them for heavy server loads. This includes a top-down strategy for architecting fast webapps from stage 1. You’ll need prior experience with JS before grabbing this title, just like most books in this list. But even if you have no experience using Node you can pick up a lot of intermediate-to-advanced techniques just by going through the lessons in this book. 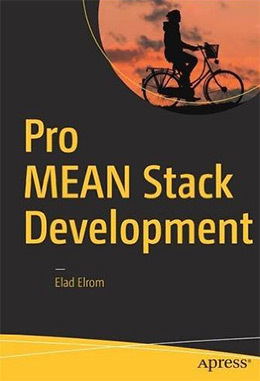 Pro MEAN Stack Development is one of the newer books in this list. It’s an incredible read and over 300 pages you’ll learn how to properly launch and scale a MEAN application. The author Elad Elrom has years of experience with programming and technical writing. This means he knows how to write code and how to document that code properly. 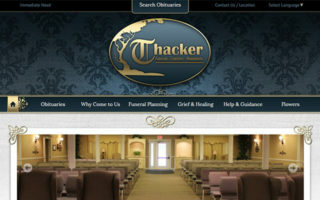 Elad’s writing style feels natural and easy to follow. He doesn’t expect much experience from the reader which is also great. The goal is to teach you how to create a build cycle on the MEAN stack that works and scales. You’ll learn all the MEAN technologies along with Gulp, Vagrant, and Webpack(among others). By the end of this book you should have a solid understanding of the entire development cycle from conception to deployment & testing. And despite the book’s title you do not need to be a professional to get started—although by the end you should know a hell of a lot about MEAN development. Programmer and writer Ethan Brown wrote this book as an intro guide for anyone to pick up MEAN. It’s dated a couple years back so some of the code samples may not be perfectly up to date. 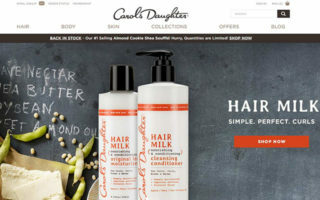 However they do work and Web Development with Node and Express teaches MEAN architecture in a clear-cut fashion. Each chapter takes you through different stages of creating a complete web application with a RESTful API. Different chapters cover different concepts and by the end you’ll learn how to build SPAs along with multi-page applications running on Express/Node. Note the author does not strictly stick to Angular and he actually uses Handlebars for templating. So this book is not the best title for a complete MEAN stack. However it is fantastic for learning Express+Node is one dev environment. You’ll learn how to debug applications, deploy them live, check for security flaws and optimize HTTP requests. 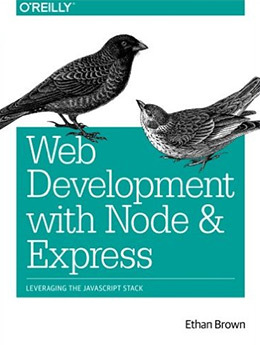 Node & Express make up a large layer of the MEAN stack and this book can take you from zero to hero as a Node developer. 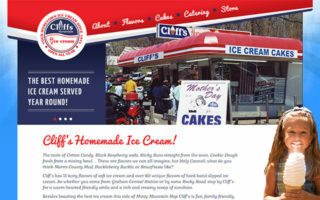 Author Jeff Dickey is a skilled fullstack dev with MEAN experience. He wrote the book Write Modern Web Apps with the MEAN Stack as a guide for new developers to dive head-first into the MEAN stack with proper coding techniques. The book spans about 250 pages and teaches in a linear fashion helping you create a fully-functional social networking app. 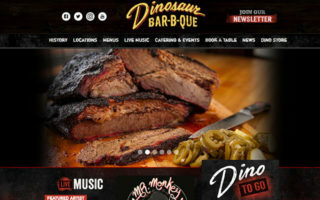 You’ll start with the Angular frontend and connect it to a REST API with Node+Express. But you’ll learn more than just coding techniques from this title. 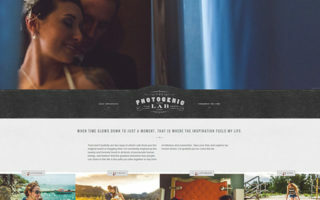 Jeff also teaches you how to properly architect and structure your project from start to finish. He covers the Gulp.js automation workflow and explains how to test your JS code for bugs. However no MEAN experience is required so if you’re a noob with Node/Express you can learn a lot from this book’s practical approach to teaching. 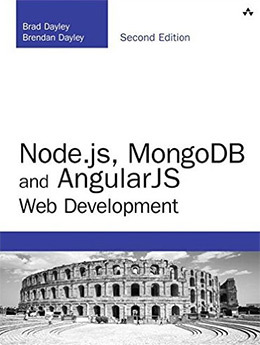 If you want a book full of exercises then Node.js, MongoDB and Angular Web Development is for you. It’s literally packed full of various exercises and sample projects made to help you understand MEAN development. There’s a new 2nd edition for this title with even more content along with some touch-ups for any outdated code samples. Each chapter is structured by different lessons on different topics. So you’ll learn each technology in the MEAN stack by following lots of little exercises to cement certain ideas into your head. At times this can be annoying or even stressful, especially for developers who have trouble learning on their own. But you can find all the related code for free on GitHub and even search Google for any problems you bump into. This book is a powerful resource for anyone who likes learning through hands-on lessons and technical problem solving. Highly recommended for any skill level as long as you’re able to push through the exercises on your own. Lastly I wanted to include an Express.js book because I think this library often gets overlooked in MEAN books. 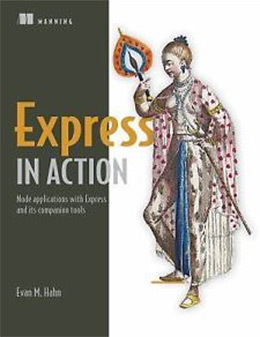 But Express in Action is undeniably the best intro book to Express.js. It covers everything in the MEAN stack including MongoDB and Node. However the author teaches from a vantage point of the Node/Express layer. You’ll learn all about the Node+Express dev ecosystem and how to properly integrate with the Express.js library. The “in action” book series always teach through practice and that’s exactly what you get with this title. You’ll learn how to connect into a Mongo database, how to test your applications, and how to automate much of the process for future apps that you create. Express in Action can be a perfect intro book for an aspiring fullstack developer. It covers Node+Express in great detail while touching upon other technologies in the MEAN stack. 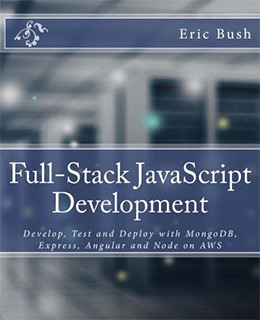 This book can help you move from a complete beginner to a more competent developer in the rapidly advancing full-JS dev environment. It’s never easy to recommend one single book since all of these titles are so incredible. But if you’re a complete beginner then I’d suggest a copy of MEAN Web Development or Express in Action. The first title covers everything about MEAN in an ultimate guide of exercises. But Express in Action works best as a slow intro starting with Node/Express which can give you foundational knowledge for MEAN development. 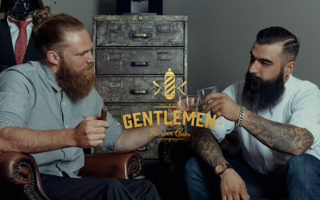 Both titles are excellent for beginners and you can’t go wrong either way. 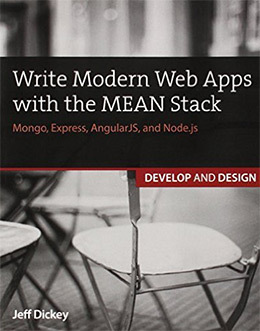 More advanced developers might enjoy Jeff Dickey’s Write Modern Web Apps with the MEAN Stack which covers a variety of solutions from security to testing and deployment.